Dianabol (Dbol - Methandrostenolone) was more or less the second Anabolic Steroid ever produced. The first, as we all know was Testosterone, which was produced in the early 1900s and experimented with by Nazis in WW2, in an attempt to produce a better soldier. Russian athletes in the 1953 World Championships as well as the Olympic games then used testosterone with great success. After that, John Zeigler, who was a doctor working with the US Weightlifting Team, began a cooperative project with Ciba to develop an equalizer for US athletes. Flash forward to 1956 and enter Dianabol ; the original trade name for Cibas Methandrostenolone... but called "Dbol" by athletes. The original package insert said that 10mgs/day was enough to provide full androgen replacement for a man and Dr. Zeigler recommended that athletes take 5-10mgs/day. Incidentally, this is also the dose that Bodybuilders were reputed to take from then until roughly the 1970s. Yeah, this was allegedly Arnolds dose, Zanes dose, etc... simply stacked with some testosterone. (For any trivia buffs out there, Dan Duchaines mail order steroid business operated under the name "The John Zeigler Fan Club"). d-anabol,Dianabol,SteroidsIn this study, done in the early 80s, a very high dose of Dianabol (100mgs/day for 6 weeks) decreased plasma testosterone to about 40% of its normal value, plasma GH went up about a third, LH dropped to about 80% of its original value, and FSH went down about a third also (these are all approximate numbers, for the sake of brevity, but you get the idea). Body fat did not go up significantly and Fat Free Mass went up anywhere between 2-7kgs (3.3kgs average gain). The researchers concluded that Dbol increases Fat Free Mass as well as increasing strength and performance. I can only agree, having found this to be the case for me when I did my first cycle (which was 6 weeks of dbol alone at 25mgs/day), I gained roughly 25lbs and kept nearly of it. Since then, Dianabol has always had a special place in my heart. In order to successfully bridge between cycles (and this means using a low dose of AAS, in this case dbol), you need to recover your natural hormonal levels to pre-cycle levels or to within acceptable parameters, and then you start your next cycle. The idea here is that you wont lose any gains, but rather a low dose of an AAS will help you maintain them. Typically, you'd use around 10mgs/day of dbol and combine it with an aggressive Post-Cycle Therapy (PCT) course of Nolvadex (and/or Clomid) and HCG. This would give you full androgen replacement from the Dbol and a shot at recovering your natural hormonal levels via the other stuff you are taking. Remember, the 100mg/day dose of dbol in the study we looked at earlier did not suppress Test, LH, or FSH to a degree that would make recovery impossible and certainly not with 1/10th that dose in conjunction with an aggressive PCT. Kick Starting: Kick starting is the most common point of Dbol use and simply refers to the beginning of a total stacked cycle in a priming sense. In reality, while “priming” is often the term used really most use it here simply because they’re eager to see gains come quickly A Dianabol cycle for this purpose will generally last approximately 6 weeks with 4 weeks generally being the minimum and 8 weeks being the maximum. Once the Methandrostenolone use is complete the total cycle will continue without the Dianabol being present but by this time more foundational steroids are well into the athletes system allowing for progression to continue. Plateau Busting: Plateau busting refers to a point during an anabolic steroid cycle in-which the individual has stagnated, gains are no longer coming and this can be very frustrating. This can occur at any time during a cycle but usually begins to show for most around the 8-10 week mark as the body begins to adapt and a change is needed. This is where a Dianabol cycle can really be useful; while it is beneficial at the beginning of a cycle it is perhaps even more efficient here. Once the new hormone is introduced and as it is so powerful and fast acting the plateau is busted and progression begins again. A typical Dianabol cycle of this nature will rarely go past 6 weeks and is often only 4 weeks. 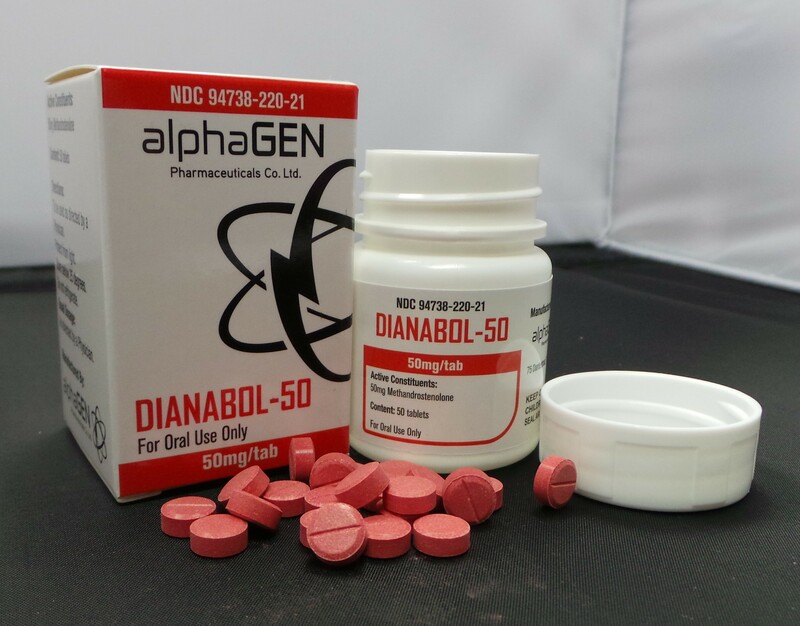 d-anabol,Dianabol,SteroidsIt is a common myth that plagues many message boards and it is nothing more than a myth; the myth states Dianabol makes you gain fat. It is true, the Methandrostenolone hormone does aromatize and by this effect can cause a lot of water retention and when bulking most rarely concern themselves with a little water. Lets examine; water retention or bloat is not fat, its water retention plain and simple. Further, many who bloat badly when implementing a Dianabol cycle automatically blame the new found bloat solely on the Dbol when more times than not a large culprit is them overeating, especially regarding carbohydrates. Finally, if water retention is truly a bad issue for you and it will be more pronounced in some than others, a good aromatase inhibitor will eliminate concern. In short, if youre eating properly, not stuffing your face like a fat cow and supplementing responsibly, massive water retention will not be a problem and any that does occur is certainly not body-fat; but can it be used while cutting?